Punk Rock Parents: Come In, and please pull up a chair! Come In, and please pull up a chair! I am totally Blue's Clued out! The Phi loves her Blues Clues so much that she now asks to watch it. Yes she can ask to watch a blue dog and her (yes Blue is a girl) adult friend look for paw prints, but she won't say Mom. 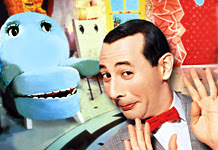 So I thought back to my Saturday morning cartoon days to try to find something that both The Phi and I could enjoy that did not involve skadooing, and I thought of Pee Wee's Playhouse. Kind of the same concept as Blues Clues. A grown man living in a house with talking furniture and animals with a bunch of neighbors who drop by, but early 90's style. A retro version if you will. complete with the word of the day, a blues puppet band, dinosaurs in a mouse hole, Penny, ice cream soup, a wedding between Pee Wee and a sandwich and a whole lot of meeka-leka-hi-meeka-hinny-ho's! Oh, what a great idea...sadly I am probably the only person in the whole world who didn't get to watch Pee Wee's Playhouse (the family got rid of the TV in the '90s, I missed out on Twin Peaks too) so it may be too late for me since I won't get the nostalgic angle, but it sounds so much more appealing than Blues Clues or *shudder* Barney or those awful squeaky things that have triangles on their heads. I am not looking forward to all of this.